Prime Minister Narendra Modi asserted on Saturday that each drop of tear shed in the aftermath of the Pulwama terror attack would be avenged. 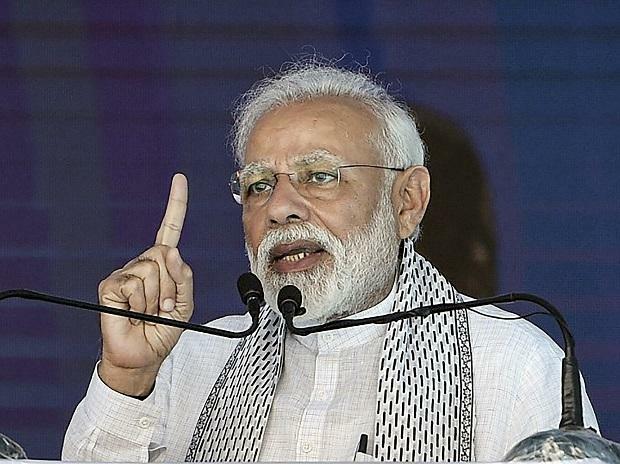 Continuing his tough talk in the wake of the ghastly strike that claimed the lives of 40 CRPF jawans Thursday, Modi said this is a "new India" which will not tolerate those who provide guns and bombs to target security personnel. Addressing a public meeting after inaugurating several development projects here in north Maharashtra, he said anger over the horrific assault in Jammu and Kashmir is palpable in the country and all eyes are moist. Modi paid tributes to the slain soldiers and hailed their families. "I have come here at a time when there is anger and eyes are moist. I salute the brave soldiers and the mothers who gave birth to them," he said. "Apart from the government, as citizens of the country, it is our responsibility to stand by the families of those who sacrificed everything for the country. "This is the time for mourning and to show restrain and sensitivity," he said. "I want to assure each family who lost their loved one that each drop of tear will be avenged (aasu ka pura pura jawab liya jayega)," Modi declared. We salute you, brave sons of Mother India. You lived for the nation and served the country with unparalleled valour. Speaking further on the Pulwama carnage, the prime minister said times have changed and the world will experience this soon. "Ours is a new India with new methods and policies, and the world will experience this now. Those who spray bullets or those who provide guns and bombs to target our soldiers, will not be spared. We will not allow them to sleep in peace," Modi asserted. The prime minister said his government has worked tirelessly for the welfare of farmers and pointed to the recent announcement of providing Rs 6,000 annually directly into the bank accounts of agriculturalists having less than five acres of land. He said the development projects inaugurated Saturday would allow Dhule to compete with Surat in adjoining Gujarat in the next 30 years. The prime minister inaugurated the Lower Panazara Medium Project constructed under the Pradhan Mantri Krishi Sinchan Yojana (PMKSY). Modi laid the foundation stones of Sulwade Jamphal Kanoli Lift Irrigation Scheme and Dhule City Water Supply Scheme. The prime minister also laid the foundation stone of Dhule-Nardana new rail line and Jalgaon-Manmad third railway line, besides flagging off the Bhusaval-Bandra Khandesh Express through video link.